May 27th – Cranky Toes and Testing – Trees & Flowers & Birds! Starting off with the beauty since the rest of the day was pretty lacking in it. Ok, not entirely true, the beach I whizzed by in the car on the way to and from work was pretty darn gorgeous but there was no chance to stop and take a photo. 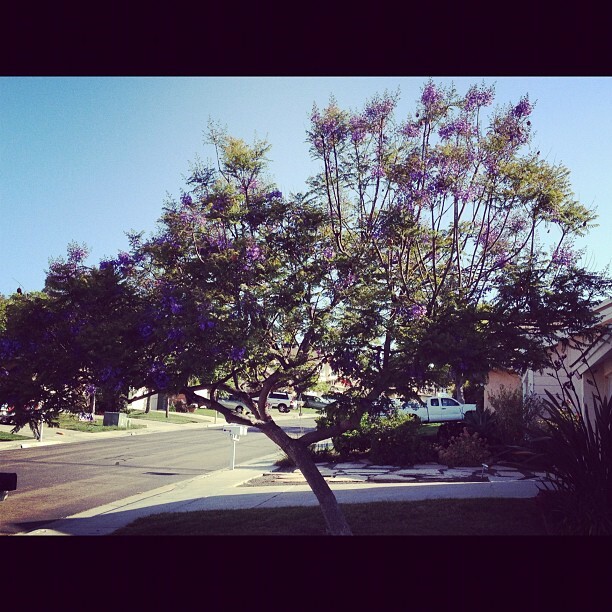 The jacaranda tree is the one in the yard next door to mine and I have been noticing on my runs around the area that they purple flowers are in full bloom right now. Really lovely. The cranky toe tale: Last month I bitched about my toe nail that sort of turns in strangely and digs into the side of the neighboring toe on my right foot. This never bothered my last year while running, but for some reason it started in this year and if I don’t file that one down on a weekly basis it seems it will be an issue. Sure enough I lagged on the grooming and paid for it today. We met up at the middle school track at 6:30am to do a 90 minute track workout. I love those because they let me work on my speed in the perfect environment. Flat, soft track with lanes to follow. Boring yes, but since we do rounds of sprints in various distances the monotony doesn’t set in. Today it was 4 1 mile runs at 5k speed for me. Since it was 4, which is longer than I usually go, I tried to pull off my effort and keep my pace at right around 10 min miles. I only achieved that once. The other three times were between 9:25-9:50. And even then one of the things that was making me alter my pace was that I could feel my toe nail digging in 😦 Right on that first mile. Ugh! I decided to just run through it, the damage was already done so other than a bloody sock I might as well push through. Well, this time the toe issue added in a bonus entire top of the toe and down one side blister. Wee! I limped home and showered and got it cleaned up and generally tended to and bandaged for the rest of the day. Since today is an odd number date and I did want to complete the even number day pattern and run again tomorrow, I really hope the toe is OK quickly. Or maybe I just go back to the track and go slow and easy. I know I *will* use that track for speed workouts again. I really want to run a true no stopping 5k and see how fast I can go. Anyway….back home and got the update that testing was going so well that we would probably be able to start before noon so I went in. It took longer than I thought it would and we weren’t done until after 2:30. A couple of glitches of course, but I think they got them all worked through by 5pm. I’m hoping for some serious sofa time tomorrow. Motivation – sometimes I have too much! May 28th – Pattern broken but writing done!